I haven’t been to a protest for a while. Think I’ll make this one. 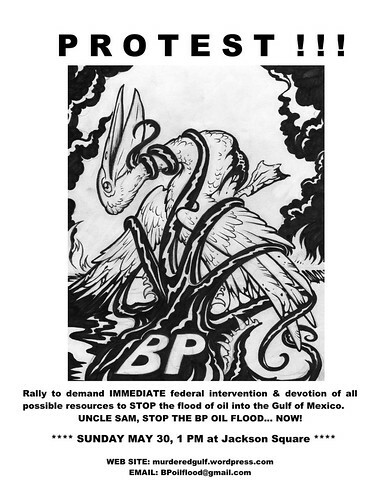 Join us on SUNDAY, MAY 30th at 1 PM in Jackson Square, New Orleans, to demand the Federal Government and BP devote all possible available resources to stopping the continued outpouring of crude oil into the waters of the Gulf of Mexico NOW! NEED PUBLIC SPEAKERS with knowledge about about the situation. Please email bpoilflood@gmail with short description of your area of expertise, affiliation. Thanks!! Please remember, this is a peaceful protest! Please, if you feel you cannot abide by that, Do Not Come! I’m not on the inside loop for this. I don’t know who’s organizing it or anything, really beyond what I’ve posted here. A website has been mounted at murderedgulf.wordpress.com but it doesn’t have a whole lot more detail at present. I believe massive protests are in order whenever massive institutions screw up in massive ways. People are outraged and that needs to be expressed. Whenever something like this is organized, I’ve noted a lot of people feel compelled to express their skepticism about the efficacy of such protests. On Facebook, a friend of mine noted that “unfocused rage never solved anything.” I agree with that. However, the rage is already there, and public actions such as a protest rally can serve to give that anger a focus that it might otherwise lack. If we don’t come together, we tend to feel isolated and weak. A well-organized protest can empower people and help them make new connections. I don’t know if this protest will qualify as “well-organized” but the potential is there. Still not convinced? Look at these pictures. Now tell me, when historians write about this chapter in our history, do you want the story to be that “no one protested”? Hey B, big fan of your blog. Also a fan of the awesome speech you gave at Silence is Violence. Thank you for posting this. I absolutely agree with your points above. More detail is coming on the website shortly, stay tuned! But the message is meant to be simple: We demand immediate federal intervention to stop the BP Oil Flood. Washington DC is standing aside while BP destroys our coast. This protest is meant to demand that the federal government take control of the oil flood that’s originating in federal waters and destroying our Gulf. Many of the people involved with this are NOT fans of government (whether our critiques come from the right or the left), but reality is that our coast is being demolished and we feel only uncle sam has the power to intervene. I live in California. These pictures are heartbreaking and infuriating. If I was there, I would most definitely attend a protest. So, please attend the protest knowing that you are representing those of us from around the country who can’t be there but are supremely pissed off and desiring accountability. Thank you. I watched a really valuable documentary show this morning on Free Speech TV. address Real ROOT causes. Like the Global Bankster Rulers of War. They are setting up Martial Law, and it’s been a long time coming. What are y’all going to do when basic FOOD infrastructure breaks down? Do you think you are guaranteed Electricity as a God-Given Right? Do you have a plan to handle No electricity? Do you think you’ll wait till the last minute to flee inland, with all the other Fools? Where you think yer goin’ up Nawth, there Sonny? You have Proof of a Destination, Sonny? Now, wait raht heah, Ma’am, while we inspect yo daughter fo her proper Shots.